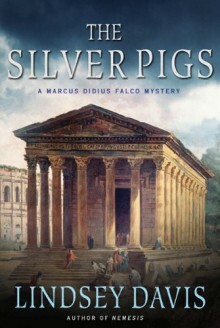 The Silver Pigs is the classic novel which introduced readers around the world to Marcus Didius Falco, a private informer with a knack for trouble, a tendency for bad luck, and a frequently incovenient drive for justice. When Marcus Didius Falco encounters the young and very pretty Sosia Camillina in the Forum, he senses immediately that there is something amiss. When she confesses that she is fleeing for her life, Falco offers to help her and, in doing so, he gets himself mixed up in a deadly plot involving stolen ingots, dangerous and dark political machinations, and, most hazardous of all, one Helena Justina, a brash, indominable senator's daughter connected to the very traitors that Falco has sworn to expose. I don't think this series is for me. I couldn't get use to the author's writing style. It felt choppy and all over the place. Well that didn't take long!Enjoy the different setting for a mystery. Bought the characters to life well.